Saudi Arabian Tourist Falls, And Drowns In River Nile While Taking A Selfie. A combined team of marine police and local fishermen on Tuesday recovered the body of a Saudi Arabian tourist who fell and drowned in river Nile will taking an extreme selfie at the river bank over the weekend. Assistant Inspector General of Police, Mr Joseph Mugisa, who heads the Police Fire Brigade, on Monday said that Alsubaie Mathkar drowned on Saturday at Kalagala Falls, in Kangulumira sub-county, Kayunga District, where he had gone with colleagues for a tour. Mr Mugisa and Mr Jamar Basalirwa the Police Commissioner, Protocol, oversaw the mission to retrieve the body from the roaring falls. The Mathkar was in company of two colleagues from Saudi Arabia, one Egyptian national and a Ugandan national, a source who requested to remain anonymous said. Mr Mugisa said Makhkar had spent four days in the country. Ms Hellen Butoto, the Ssezibwa Regional Police Spokesperson said Makhkar met his fate as he took a a selfie using his mobile phone. Ms Butoto said, Makhkar, however, slipped and fell in the fast-running water that swept him and claimed his life. “On Monday we were able to recover one of his shoes near the spot of the accident. This gave us hope and a hint in which exact area we have to search,” Mr Mugisa said. 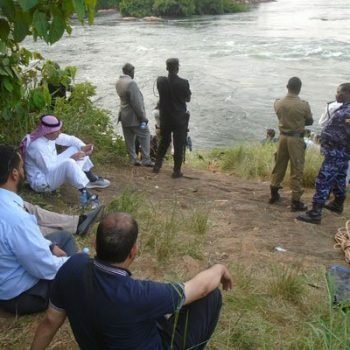 He said that the Saudi Arabian ambassador to Uganda, Dr Abdallah Alkahtani and his deputy, Mr Bander Alfafi, were on Sunday and Monday at Kalagala Falls as the divers searched for his body. He said the two envoys tried to board canoes and join the search teams but were restrained by security. Makhkar’s body, Mr Mugisa said, was recovered by local fishermen on the banks of River Nile at Mutukula village, about 10 kilometres from the spot where he drowned. However, there was a fracas between the fishermen and Saudi Arabian nationals as the former demanded for the Shs5 million reward, which they were reportedly promised by the Saudis, who allegedly wanted to offer Shs2 million. The fishermen refused to hand over the body until they were paid the full amount. Two sons of the deceased travelled from Saudi Arabia on Sunday night and camped at the site on Monday and Tuesday. The body has been taken to Mulago National Referral Hospital, for a post-mortem. It is not yet clear when the body would be flown back to Saudi Arabia for burial. Residents told journalists that a number of people have drowned at the very spot which has no barrier or sign to warn to visitors, who ignorantly come to have a good time.